Our NHL playoff models use team-level and individual player statistics to predict the probability that a team will win a given series. We build our bracket by advancing the team with the higher win probability for each series. For example, this year, our models give the Chicago Blackhawks a 74% chance of winning their first round series against the Nashville Predators, so we advanced the Blackhawks to the following round in our bracket. While we utilize multiple models to generate predictions for each series, the bracket below represents the average probability of all models for the 2017 NHL Playoffs. 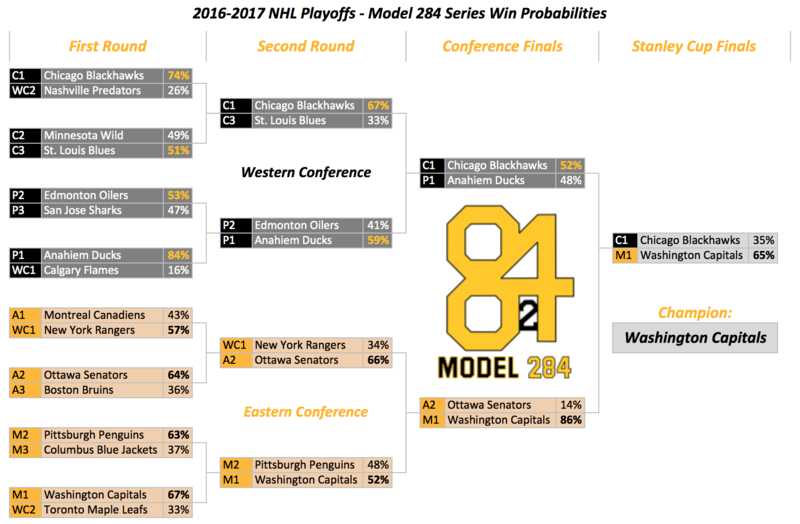 For more information on our NHL Playoff Models, see our methodology article here. Looking at the field as a whole, The Model has identified a clear-cut top four teams with the best shot to win the Stanley Cup in the Washington Capitals, Pittsburgh Penguins, Chicago Blackhawks, and Anaheim Ducks. The Model has the Washington Capitals taking home their first Stanley Cup in the Ovechkin era over the Chicago Blackhawks. It is not hard to see why the numbers like the President Trophy winning Capitals, but we will see if this is the year Ovechkin and company can finally put it all together. Albeit a weak Metropolitan conference, the model also likes the Ottawa Senators to reach the Eastern Conference Finals on the heels of Erik Karlsson, despite the fact that they are underdogs in their first round series against the Boston Bruins. To Wild fans, maybe are best bet is that Boudreau laces up the skates and puts the game into his own hands. Isn’t that why we paid him so much? Anyway, there really is nothing quite like playoff hockey, so have a couple of beers, bet the house on the Caps, and most importantly, Trust The Model.